Procrastination is one of Satan’s favorite things. He loves for God’s kids to procrastinate. To relax. To get comfortable. To lose all sight of urgency. I’m not just talking about reaching the lost or finally having a heart-to-heart with that person God laid on your heart a month ago, although that is part of it. I’m talking about working in the mundane, every day, seemingly meaningless tasks. The ones you don’t love but have a responsibility to do. Satan loves for you to put off doing those things so you will be distracted and focus on something else, when God has called you to complete the task at hand. For example, transcribing has become that for me on the job. I adore my job and am so thankful to work in a completely Christ-centered environment, but transcribing–whether it be sermons or interviews–has become a chore. Therefore, when I’m transcribing it doesn’t take much for me to get distracted and start doing something else when I should be focusing on accomplishing the present goal. Why is it so easy to procrastinate on the job? 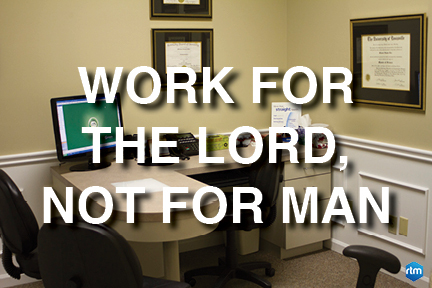 If we truly realized our boss was not just some person–one we may or may not like–sitting in a bigger office than ours, but was the Lord Jesus Christ, would we work differently? God, through the provision of our job, has set before us a task. Maybe we like it, maybe we don’t, but it’s been given to us by the Father to make much of Him through it. By the way you work, do you demonstrate to your coworkers, management and Satan a different work ethic than the world? Do you work for a cause (Christ’s glory) or for applause from men? Do you work diligently, excellently and purposefully, thereby demonstrating how God works diligently, excellently and purposefully at all things? May the beauty of Christ radiate through our work ethic so that others may see our good works and glorify God. May we work in such a way that it causes others to stop and stare, racking their brains to figure out why we labor the way we do. Then let their wondering end at the foot of the cross. For it is for Him–the One who sacrificed it all–we work. This is my prayer for us as believers. May it be so. This entry was posted in Monday Morning Munch. Tagged colossians 3, glorifying Him, God, lord jesus christ, making much of God, monday morning munch, on the job, procrastination, religion, spirituality, work ethic, work for the Lord and not for man. Thank you! I hope you are pushed toward the Lord.